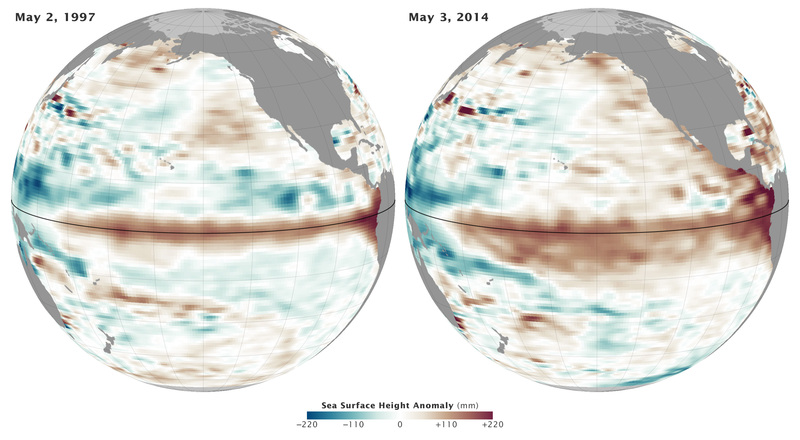 NASA Visible Earth: Is El Niño Developing? Data courtesy NASA JPL Ocean Surface Topography Team. Maps by Marit Jentoft-Nilsen and Robert Simmon. Caption by Michael Carlowicz. Data from ocean-observing satellites and other ocean sensors indicate that El Niño conditions appear to be developing in the equatorial Pacific Ocean. Conditions in May 2014 bear some similarities to those of May 1997, a year that brought one of the most potent El Niño events of the 20th century. During an El Niño, easterly trade winds in the Pacific falter and allow giant waves of warm water—known as Kelvin waves—to drift across from the western Pacific toward South America. Surface waters in the central and eastern Pacific become significantly warmer than normal, altering weather patterns and affecting fisheries along the west coasts of the Americas. El Niño also can have a significant influence on weather and climate far from the tropics. The maps above show the ten-day average of sea surface height centered on May 2, 1997 (left), and May 3, 2014. Shades of red and orange indicate where the water is warmer and above normal sea level. Shades of blue-green show where sea level and temperatures are lower than average. Normal sea-level conditions appear in white. The 1997 map was assembled from data collected by the TOPEX/Poseidon satellite, while the 2014 data comes from the Ocean Surface Topography Mission/Jason 2 satellite. “What we are now seeing in the tropical Pacific Ocean looks similar to conditions in early 1997,” said Eric Lindstrom, oceanography program manager at NASA headquarters. “If this continues, we could be looking at a major El Niño this fall. But there are no guarantees.” Observations from a network of sensors within the Pacific Ocean support the satellite view, showing a deep pool of warm water that has been sliding eastward since January. The years 1997–98 brought El Niño out of the scientific literature and onto the front pages and evening newscasts. It was one of the strongest El Niño events observed, with extreme weather impacts on several continents. North America had one of its warmest and wettest winters on record, particularly in California and Florida. Peru, Mexico, and the rest of Central and South America endured devastating rainstorms and flooding. Indonesia and parts of Asia saw disastrous droughts. Scientists at the Climate Prediction Center of the National Weather Service (NWS) announced on May 8 that they foresee a 65 percent chance of a transition to El Niño in the summer of 2014. “There remains uncertainty as to exactly when El Niño will develop and an even greater uncertainty as to how strong it may become,” NWS reported. Jet Propulsion Laboratory (2014) Historical El Nino/La Nina Watch. Accessed May 13, 2014. NASA Earth Observatory World of Change: El Nino, La Nina, and Rainfall. National Weather Service: Climate Prediction Center (2014, May 8) El Nino/Southern Oscillation Diagnostic Discussion. Accessed May 13, 2014. NOAA Climate Watch (2014, April 25) Slow slosh of warm water across Pacific hints El Nino is brewing.